Rooting or jailbreaking lets you get full access of your device. Rooting most of the devices is not easy and takes quite an effort before you can get root access. However rooting or jailbreaking the Google Chrome Cr-48 Notebook is as easy as pushing a button! 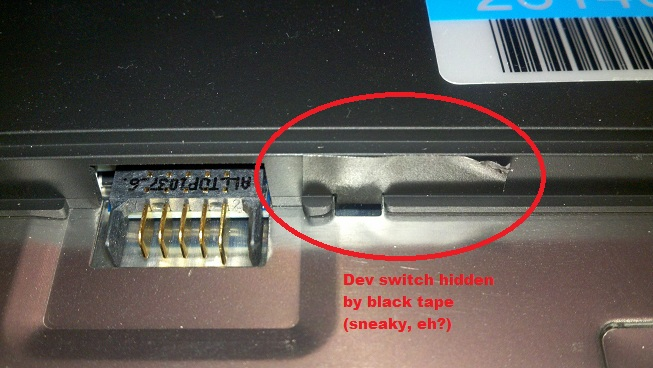 In this article we will tell you how to root the Cr-48 notebook or get to the developer mode as Google terms it. You can check this post for knowing more about the Chrome cr-48 notebook and it's features. Step 1: Turn off your Cr-48 notebook and remove the Cr-48's battery by sliding the battery lock over. Step 2: On the right hand side of the battery's gold contacts, you can find a black tape as shown in the picture above. Now take-off that tape under which you will find a white switch. 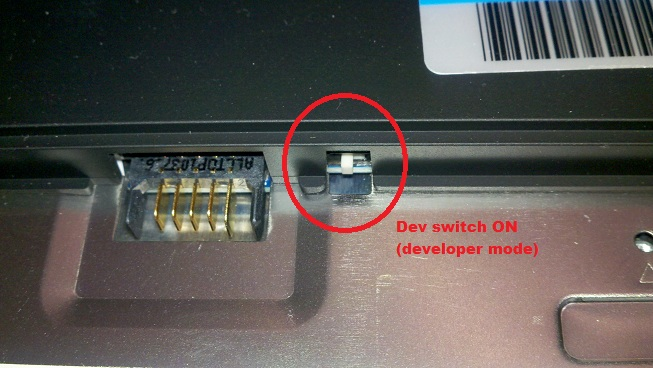 Step 3: The current state of the white switch is what puts the Cr-48 notebook in user mode. Now, in order to activate the developer mode, push the white switch towards the gold connectors. Check the picture below for further illustration. Step 4: Replace the battery and power on your Cr-48 again. Since this will be the first time you boot your cr-48 notebook in Developer mode, you will get a message warning you that the software cannot be trusted. But you need not worry and safely skip this message by pressing CTRL+D on the keyboard. Step 5: Now the stateful partition on your cr-48 device will be automatically wiped, a security measure. This process takes 5-10 minutes. Once done, the notebook will reboot. Step 6: Now after the reboot, once you get to the Chrome browser on the Cr-48 Notebook, press CTRL+ALT+T from your keyboard to get to the limited crosh shell. Next, type "shell" to drop to a full bash shell. You will be logged as a special user named chronos. Step 7: (Last Step) Now type sudo su - and you will be dropped to a root shell with access to everything on the cr-48 notebook.